How do we move from the tribal shouting to a more humane discourse with one another? Travis Smith's Superhero Ethics finds surprising solutions in the world of conflicting superheroes. Superhero Ethics: 10 Comic Book Heroes; 10 Ways to Save the World; Which One Do We Need Most Now? In many places in-person and online, demonization has become synonymous with debate, and confirmation bias with conversation. Can superheroes teach us anything about civility and citizenship in a democratic society? As broadly-construed metaphors for past and present political philosophies, political scientist and professor Travis Smith thinks so. As such, Smith's argument for the societal relevance of superheroes is consistent with those of other scholars (e.g., Bainbridge, 2007; Reyns & Henson, 2010; Sharp, 2012; Vollum & Adkinson, 2003). In Superhero Ethics (2018), Smith analyzes ten superheroes in the form of a contest, pitting them against each other with regards to their personal ethics and the implications of those ethics for democratic societies. After briefly summarizing Smith's analytical approach (spoiler-free), I will highlight what I believe to be three implications we can take from Smith's analysis that just might help our socio-political discourse as a democratic society become more humane, meaningful, and ultimately more super. 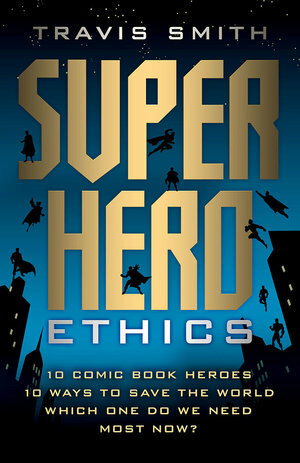 Superhero Ethics (2018) contains seven chapters, with five devoted to contests between ten superheroes. In the introduction, Smith lays out the purpose of the book, which is to determine which superhero's ethical perspective, metaphorically speaking, is the most admirable and therefore most needed in today's socio-political context. In addition to articulating the book's purpose, Smith does a great job of addressing the relevance of superheroes and providing disclaimers and clarifications related to his subsequent analysis in a way that I believe makes the book more interesting to someone such as myself whose background is in human development and not political science. The first contest is between the Hulk and Wolverine, two superheroes dealing with animalistic rage but manage it in different ways. Second, Iron Man and Green Lantern face off with regards to the ways they leverage their willpower and imagination in the service of others. The third contest features Batman and Spider-Man, superheroes who care very much—albeit in different ways—about the cities they reside in and are committed to protecting. Captain America versus Mr. Fantastic makes up the fourth contest, with the focus being on how their lives are indicative of their orientations towards practical and contemplative orientations towards wisdom. The last two superheroes pitted against each other are Superman and Thor, with Smith (2018) comparing and contrasting how each "says something" about the inherent dignity and capabilities of humanity. The order of the contests is intentional, as he starts with metaphors for the more beastly aspects of the human condition (Hulk and Wolverine) and ending with metaphors for the more divine aspects of the human condition (Superman and Thor). In the concluding chapter, he compares and contrasts each chapter's winner until ultimately one superhero is left standing. One of the characteristics of a popular culture product is that it constantly provides material for us to compare and contrast. Questions such as Which decade had better cartoons—'80s or '90s? and Who has the better supervillains—DC or Marvel? easily yield hours of debate amongst the most dedicated, and at least a hearty discussion amongst those casually interested. Superhero narratives, I argue, add an intriguing element to this due to their use of time-travel, alternate universes, temporary "deaths", and reboots to give readers and audiences glimpses into different possibilities for a given character. Aware of how commonplace these different representations of popular superheroes are, Smith (2018) specifies the starting point for his analytic approach, which is the "ethical core" (p. 7) of each superhero he will analyze; a core he believes is the reference point for the various alternate depictions of these characters. Seemingly a minor yet necessary formality, I took Smith's specification in this regard to mean something more. Generally speaking, insofar as we belong to social groups, there are basic things—norms, understandings, information, expectations, etc.—that tend to serve (implicitly or explicitly) as a baseline orientation (to use Smith's phrase) from which subsequent interactions follow within and on behalf of those groups; actions that can result in or take the form of disagreements among members of the group. For example, members of a family (however the members choose to define "family") may disagree, but those disagreements are usually expressed in ways that are subordinated to the commonalities that bound those members into a family, to begin with (e.g., blood, shared experiences, etc.). In other words, family members who disagree on a given issue often do so with the understanding that whatever it is that truly makes them a family will (or at least should) not be disregarded or degraded. The same generally goes for disagreements about issues among members of other social groups. Indeed, there are instances where disagreements between individuals do lead to degradations of the binding features of those relationships (e.g., a disagreement that ends a friendship). However, my experience suggests that these are the exceptions, not the rule. When it comes to socio-political discourse within a democratic society, I think it could do us some good to apply Smith's (2018) approach to superheroes to our own conversations and debates about relevant issues. Just as Smith first specified an area of general agreement (i.e., an "ethical core") by which an analysis of superheroes could follow, as participants in a democratic society, we should consider taking inventory of our areas of general agreement regarding an issue before articulating our areas of disagreement. Both kinds of understandings (shared and divergent) should be important to us; a notion consistent with research suggesting that social groups are multifaceted configurations in which members agree on certain matters and disagree on others (Turiel, 1996, 2002). Which Evaluative Criteria Are We Using? Once we acknowledge one or more areas of general agreement related to issues they care about—be it in the realm of popular culture, politics, or otherwise—I believe the next important step is for us to clarify the criteria we are using to evaluate the aspect(s) of the issues we disagree about. Although the quote above notes that at times we make evaluative judgments based on inaccurate or incomplete information, the point I want to emphasize is that we often bring our own evaluative criteria to an aspect of an issue we are discussing or debating with others, and at times our criteria differ from theirs. Furthermore, I think we tend to compound matters by not being upfront about the nature and sources of our criteria, instead of putting our focus on mainly trying to convince others of the correctness of our position and the incorrectness of theirs. In the realm of popular culture, this is often seen in "Who's the greatest?" debates involving sports (athletes, teams) and musicians (solo artists, bands). In my opinion, one reason why these kinds of debates are so common is that people often differ in the criteria they are using to determine "greatest". In the LeBron vs. Michael Jordan debate, for example, is the primary criteria championship rings, all around statistics, consecutive trips to the finals, or something else entirely? Similarly, when debating amongst our friends the best films or TV shows in a given genre, how much weight do we give to the creativity of the premise/plot, depth of characters, quality of story, cinematography, whether the end provided a sense of closure, etc.? I think Smith (2018) understands some of the problems that can stem from discussions or debates approached in this manner, and it leads him to provide examples of different evaluative criteria that could be used to analyze superheroes with regards to who is the "best" before clarifying the evaluative criteria he decided to use. Some of the examples of criteria Smith gives include the most powerful, the most relatable, and how they are viewed by fellow superheroes. After arguing that for the purpose of his analysis comparing superheroes along the lines of who is most "praiseworthy" (p. 4) is more appropriate than who is "best", he then proceeds to outline his criteria for two kinds of evaluations (decisions). First, he states that the criteria for his analysis (i.e., the basis for evaluating the superheroes) are based on the ethical perspectives they represent and whether or not those perspectives serve as good models for today's socio-political context. Second, he gives careful consideration to the selection of superheroes and the exclusion of others, criteria that includes (1) only including superheroes he understood as exemplifying an important ethical perspective or concern, (2) only including superheroes whose qualities were distinct enough to provide clear comparisons and prevent overlap, and (3) excluding superheroes who were idiosyncratic personal favorites and those whose origin stories depended upon other superheroes. In addition to the idea that people often discuss or debate one or more aspects of issues using different evaluative criteria, research suggests that the (1) information/understandings we bring to an issue (e.g., Turiel, Hildebrandt, Wainryb, & Saltzstein, 1991; Wainryb, 2004), as well as (2) information received or altered while being presented with an issue (e.g., Wainryb, 1991, 2004), can influence our evaluations of the issue. Thus, it seems plausible that in some instances, the reasons why we disagree on a given aspect of an issue is because we have different understandings of that aspect, and these understandings inform the kinds of criteria we use to evaluate that aspect. As citizens in a democratic society, our ability to engage in respectful and productive discourse and debate at least in part may depend on the extent to which we are transparent about the differing evaluative criteria we may bring to bear on an issue, and the sources of those criteria. If we are not transparent about these matters, then it might be easier for us to talk at or about each other instead of with each other. Which Problem(s) Is (Are) We Trying to Solve? If our own evaluative criteria for and information/understandings of an issue can inform how we judge that issue, then what happens if instead of evaluating issues (or aspects of issues) we are trying to find solutions to problems? In essence, much of the topics dominating current socio-political discourse (gun rights, immigration, criminal justice reform, health care, economic stability, corporate greed, etc.) and much of what distinguishes political parties and philosophies revolve around trying to find the best solutions to society's most pressing problems. But insofar as we engage in dialogue about what we consider to be viable solutions, are certain we agree on the nature of the problems? As someone who has been married for ten years, I have engaged in many arguments with my wife that, after stepping back and reflecting on them, stemmed from our differing perspectives on or conceptions of a particular thing. Although not to the same degree, similar instances of differing construals (i.e., understandings, meanings) have occurred in my discussions or arguments with friends, colleagues, and other family members. In a way, these experiences—coupled with my familiarity with research examining the nature and nuances of socio-moral judgments—have played an important role in my belief that when multiple people are disagreeing on a solution to a problem, it should not be assumed that their proposed solutions stem from the same understanding of the problem. Along these lines, in the concluding chapter Smith (2018) frames his final analysis of the winners from the preceding chapters with regards to the relationship between the nature of a given societal problem and the potential relevance or appropriateness of a given solution. In other words, Smith contends that based on what he believes to be the most pressing problem facing our democratic society, one superhero's perspective provides the best model moving forward. Before crowning an ultimate winner, Smith revisits each preceding contest (chapter) based on the nature of the particular societal problem facing citizens for which he believes the contestants offer ethical perspectives that serve as potential solutions. Some examples of societal problems explored include the (1) lack of personal accountability (Hulk vs. Wolverine), (2) lack of social institutions and of cooperative and kind social relations (Batman vs. Spider-Man), and (3) degree of divisiveness amongst individuals (Captain America vs. Mr. Fantastic). Similar to being transparent about our evaluative criteria, being clear about our understanding of the nature of a problem when discussing or debating solutions with others may go a long way towards being understood, understanding others, and hopefully finding productive solutions. In sum, I contend that Smith's (2018) approach to analyzing superheroes which included (1) establishing a baseline orientation, (2) specifying evaluative criteria, and (3) specifying the relationship between the nature of the problem(s) and the proposed solution(s) provides some useful food-for-thought for today's socio-political context. Regardless of the issue, approaching a discussion or debate in a way that begins with one or more areas of general agreement, is upfront and clear about the criteria one is using to evaluate the issue (or one or more aspects of it), and proposes solutions in a way that binds them to one's understanding of the nature of the problems may lead to discourse that is both more humane and more likely to yield effective solutions with regards to societal problems. Moreover, a better understanding of our areas of general agreement, as well as the nature of our differing construals in the areas where we disagree, may guard against the temptation to attribute people's differing perspectives to negative personal traits (Ross & Ward, 1996). With all of the problems characterizing our current society, an unwillingness to relate to and understand each other should not be one of them. For many socio-political issues, proponents of various positions often appeal to considerations related to welfare, justice, legality/constitutionality, and/or civil liberties when justifying their positions, and do so to varying degrees (e.g., one person may subordinate all other considerations to welfare ones, whereas another person may prioritize adherence to the law/constitution above everything else). Given the ambiguous or multi-faceted nature of these issues and the extent to which our perspectives on matters are formed against the backdrop of our experiences with others, social groups, and societal institutions, it is not surprising that we often disagree on matters of importance in ways that are reinforced through our political orientations. Moreover, influenced by the foundational work of social psychologist Solomon Asch (Asch, 1940, 1952; Asch, Block, & Hertzman, 1938), research across a wide range of topics attest to both the role group norms can play in influencing our evaluations (Cialdini & Trost, 1998; Tankard & Paluck, 2016) and the regularity through which people evaluate group norms on the grounds of fairness (Turiel, 1996, 2002; Turiel, Chung, & Carr, 2016). In the political realm specifically, research suggests that group norms can inform our evaluations of political activities (e.g., rallies, voting) and/or policies (Anoll, 2018; Cohen, 2003; Ross & Ward, 1996). Moving towards more humane discourse may also help safeguard us against some of the trappings inherent in engaging in serious issues on social media platforms. In my opinion, these platforms are incompatible with healthy discourse about complex and ambiguous issues because the main things these issues require—context, qualifiers, and evaluative criteria—take time and careful consideration whereas the platforms tend to encourage immediate and gratification-seeking responses. In addition, since ambiguous issues (compared to more straightforward issues) may be more (1) susceptible to group norm influence (Asch, 1940, 1952; Asch et al., 1938) and (2) likely to lead us to discount the role of construals in the perspectives of those we disagree with (Ross & Ward, 1996)—even if we may not necessarily be aware of their influence on our judgments (Asch, 1940, 1952; Cohen, 2003)—it is not surprising that discussing or arguing about ambiguous issues on social media can easily result in us forming our own ideological bubbles and mischaracterizing those who reside outside of them. The temptation can be strong, as at times I am guilty of prejudicing my initial reactions to certain events and actions before taking the time to adequately understand the events and actions in their totality. I am working on getting better, but I have a long way to go. Given the multifaceted nature of the problems we face and the fact that America is increasingly becoming more diverse, it is imperative that we move away from ideological bubbles and mischaracterizing those who disagree with us on socio-political matters. My hope is that we give one another the benefit of the doubt more often than not, potentially using the implications from Smith's (2018) analytical approach to superheroes and the above-mentioned literature as starting points toward more humane discourse. And given that we do not have the luxury of comics' ability to simultaneously communicate a person's thoughts, words, and actions, we may not have much choice but to challenge ourselves if we want to leave this country a better place tomorrow for the kids and youth of today. Anoll, A. P. (2018). What Makes a Good Neighbor? Race, Place, and Norms of Political Participation. American Political Science Review, 1-15. Unable to locate DOI. Asch, S. E. (1952). Social psychology. NJ: Prentice-Hall. Cialdini, R. B., & Trost, M. R. (1998). Social influence: Social norms, conformity, and compliance. In D. T. Gilbert, S. T. Fiske, & G. Lindzey (Eds. ), The handbook of social psychology (4th ed., Vol. 2, pp. 151– 192). Boston: McGraw-Hill. Reyns, B. W., & Henson, B. (2010). Superhero justice: The depiction of crime and justice in modern-age comic books and graphic novels. In Popular Culture, Crime and Social Control (pp. 45-66). Emerald Group Publishing Limited. Ross, L., & Ward, A. (1996). Naive realism: Implications for social conflict and misunderstanding. In T. Brown, E. Reed, & E. Turial (Eds. ), Values and knowledge (pp. 103– 135). Mahwah, NJ: Erlbaum. Sharp, C. (2012). 'Riddle me this…? 'Would the world need superheroes if the law could actually deliver 'justice'?. Law Text Culture, 16, 353-378. Unable to locate DOI. Smith, T. (2018). Superhero ethics. PA: Templeton Press. Turiel, E. (1996). Equality and Hierarchy: Conflict in Values. In T. Brown, E. Reed, & E. Turial (Eds. ), Values and knowledge (pp. 75–101). Mahwah, NJ: Erlbaum. Turiel, E. (2002). The culture of morality: Social development, context, and conflict. Cambridge University. Turiel, E., Chung, E., & Carr, J. A. (2016). Struggles for equal rights and social justice as unrepresented and represented in psychological research. In S. S. Horn, M. D. Ruck, & L. S. Liben (Eds. ), Advances in child development and behavior (Vol. 50, pp. 1–29). Burlington: Academic Press. Wainryb, C. (2004). Is and ought: Moral judgments about the world as understood. In B.W. Sokol & J. Baird (Eds. ), Mind, morals, and action: The interface between children's theories of mind and socio-moral development (Vol. 103, pp. 3-17). San Francisco: Jossey-Bass. Vollum, S., & Adkinson, C. D. (2003). The portrayal of crime and justice in the comic book superhero mythos. Journal of Criminal Justice and Popular Culture, 10, 96-108. Unable to locate DOI.